Ok, so not strictly cycling related but it is general health, so I guess this can go here really! So I’m probably guilty of falling for marketing hype and getting some of the fitness devices. A few months back I’d purchased one of the body fat scales that’s also wi-fi enabled and records my weight (Fitbit Aria). Much to the amusement of my work colleagues! Once I got that, I’d been considering a pedometer. Obviously the initial thought was to get a Fitbit one. It would complement the scale, would appear on the same website and they offered a range of different items. But then I stumbled across the pre release information for the Gamin Vivofit. Not only did this promise to be integrated into Garmin Connect, where I already record all my activities for cycling and running, but unlike the other wrist band mounted devices, also included a watch (so I actually don’t have to wear two bands - I already wore a watch and on the other wrist, I use a Road ID) so I wasn’t to happy to be wearing a third wrist band. The other plus side (other than replacing the watch), was that the batteries in the Garmin are considered to last for upto a year before needing a recharge. Compare this to the week long battery of the Fitbit devices and the decision was easy! I’d pre-ordered the device on Amazon but I saw a tweet this week that John Lewis was an exclusive stockist to start with in the UK, so I nipped into the store on Thursday night and picked one up (and then cancelled my Amazon order). I’d been waiting since I’d seen them being released to get one so getting one a few weeks earlier for only £2 more, seemed like a reasonable compromise. Sometimes working in London has some positive perks. So it’s been about a week since I picked one and it’s generally been reasonable. In general, the accuracy seems to be ok - I can’t comment on exactly how accurate they are as I’ve not got anything else to compare it to. 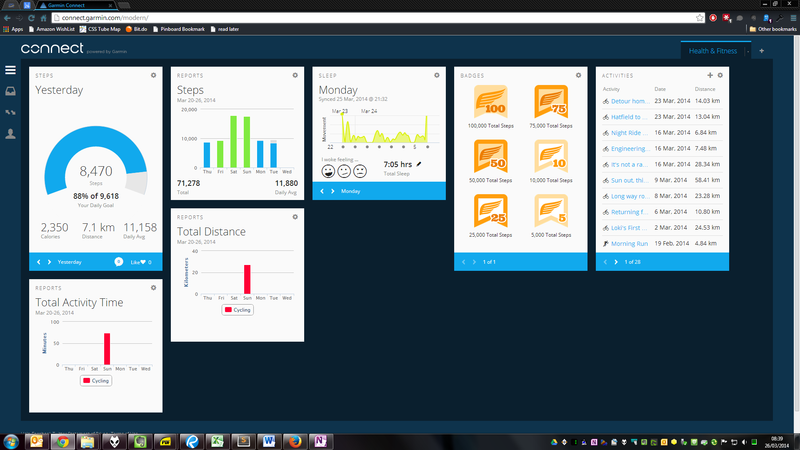 However, it does seem to show more steps on the days I’ve known I’ve walked more, which is what I would expect! It does however, seem to count arm movements sometimes - simply waving my arm doesn’t seem to set it counting, but using the shower and moving the shower head could set it off, as did throwing a juggling ball from one hand to another. So clearly, the numbers it gets each day should be considered to be estimates, but I think is likely to be the case anyhow with any device that measures steps from a wrist position. I’ve seen an article calling them “wearable snake oil”, which perhaps a good description, as by themselves, they wont help you lose weight or get fit. However, by having some ideas on how often you move and the like, this can help you make informed decisions which can benefit you. If you’re clearly under your goal every day, you know you need to do some work to make sure that you improve the number of steps you take each day. 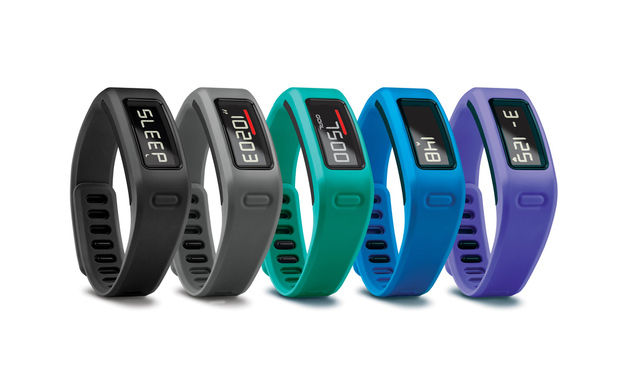 The Garmin Connect website has undergone a change to represent the additional data that the Vivofit will sync to the website. There’s now a home page that you can add and remove widgets as you want. Whilst it can show you almost everything you’d want, it doesn’t tie in with the old website that would let you track a goal - for example, I wanted to ride 2,500Km this year and set a goal on the Garmin website, prior to the update. Now, with the new landing page, I can’t see it and it’s not one of the widgets. At the end of the day, it’s a free service, but it is slightly annoying that I can’t view this goal anymore! Overall, the waterproofness means I can happily wear it at all times, which is good and something I was disappointed by it’s competitors for. What’s the point in it if I have to take it on and off all the time? Likewise, it tracks sleep (which I’m not sure about) but unlike it’s competitors, it doesn’t need to be charged up overnight and therefore it makes more sense and can actually do what it’s supposed to. Build quality is good, something I’d expect from a Garmin product. It comes with two different size bands to clip the device to so you should be able to fit any size arm. The band is a bit of a pain to do up but because I keep it on all the time, I don’t need to deal with this once I’ve put it on. After owning it for a while, I’m not entirely sure of the benefits of it. It’s a decent bit of kit and provides some interesting data, however, I’ve not really acted on it or sat down to look at it all. I’m sort of collecting data for the sake of collecting data. I tend to use it more as a watch and then it’s limited - it syncs the time with the Garmin website but it seems to be a minute slow. Which, once I figured out wasn’t to bad but means I have to bear that in mind when going to catch the train! Overall, I’ll give it the benefit of the doubt and perhaps I’ll see how it fairs over the next few months. Maybe if I took more notice of it, it would prove to be far more helpful!